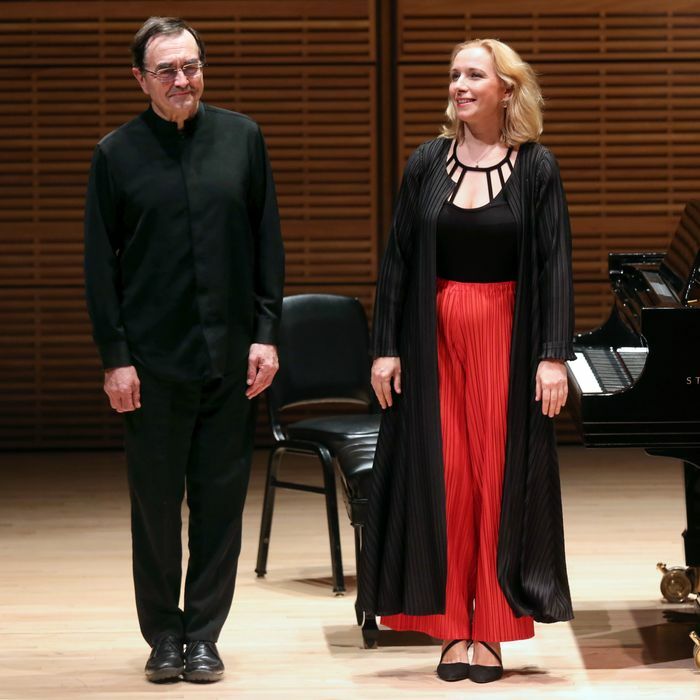 Aimard and Stefanovich at Zankel Hall. Silence in a concert hall is an unachievable goal, but the pianist Pierre-Laurent Aimard expected it anyway, his fingers poised at the keyboard before he began playing, waiting out the hacks and harrumphs and the subway that regularly murmurs past Zankel Hall. He and his partner Tamara Stefanovich needed that foundation of silence, however brief, to erect Messiaenâs massive but soaring two-piano piece, Visions de lâAmen.The first sonority, a deep subterranean rumble and a high, icy ping, sets out the floor and spire. The next 50 minutes of music flesh out the splendors in between. Messiae n conceived of composition as prayer, and I have always worried that, as an irreligious person, I was just scraping profane pleasure off the surface of his music and missing out on its substance. But Aimard and Stefanovich muted those doubts, building up a cathedral out of stained-glass colors, piano tracery, rhythmic vaults, and thick trunks of sound. A Messiaen chord is a crystalline, faceted thing, full of internal symmetries that shimmer and glint. Just one would be enough to contemplate for a while, a snowflake on a fingertip. Instead, they come in flurries, piling up before your ear. By rights they should meld and melt together, but they donât â" not in Aimardâs and Stefanovichâs hands. To hear them play Visions is like listening with superpowered ears, each detail magnified and limpid, and at the same time arranged into an expressive structure. Twenty fingers seem too few to produce these intricate sonorities, and too many to produce that unified breath. After all these years of concertgoing, I still find it hard to believe that such miraculous performances can be planned, scheduled, and executed several times a week. Aimard arrived in New York only hours before the concert (his visa-stamped passport had been held up in the mail), yet neither jet lag nor bureaucratic screwup dulled the rapturous intensity. He and Stefanovich warmed up for Visions de lâAmen with a first half of BartÃ³k, Ravel, and a dense, prickly new score by Harrison Birtwistle that would have exhausted any other duo. I have no doubt they could have gone out for a burger after the concert, then done it all over again.